Before we get back to the water color pages I thought I would show you the cover of the little journal I decided to make. I still haven't decided what to put on the tabs but that will come in time. I stuck with a nature inspired theme for the cover and added about 12 cardstock pages in between the tabbed pages I made a couple days ago. I cut 2 pieces of book board 4 3/4 x 6". Covered them with patterned paper - the ledger paper is from 7gypises. I rounded the corners of the book board and punched the holes with the Binderie Punch. I added a piece of vintage music paper across the front with Matte Medium. Then waited a few minutes for it to dry, then covered the entire surface with the same medium. Once dry, I took some Claudine Hellmuth Sky Blue paint and painted the outside edge (think quick and random here). I know it looks garish but we will fix that in a minute. Take a baby wipe and wipe away what you don't want (still very random). Because I sealed the surface with the Matte Medium I can manipulate the paint until I like the way it looks. It will only take a few minutes to dry so work quickly. To complete the cover turn the 7gypsies ledger paper over and cut out the bird, the red floral block and the text in the blue box from the back side of the paper. The stick came from my neighbors tree and is wrapped with a little cheese cloth and held in place with Golden Gel Medium. I cut "her tender heart" from an old book and stamped the number 26 with the new 7gypsies Numero stamp and black Archival ink. I used the same watercolor method shown in the last post. This time using Weathered Wood and Wild Honey (loving these two colors together). Here is the finished tabbed page. All the stamps are from the new 7gypsies Conservatory stamp. If I would have had a plan to start with, I would have positioned the butterfly over a bit so that when I punched the page it would not have gone into the sewed circle. But I didn't, so it does and I'm okay with that. This in fact turned out to be my favorite one. 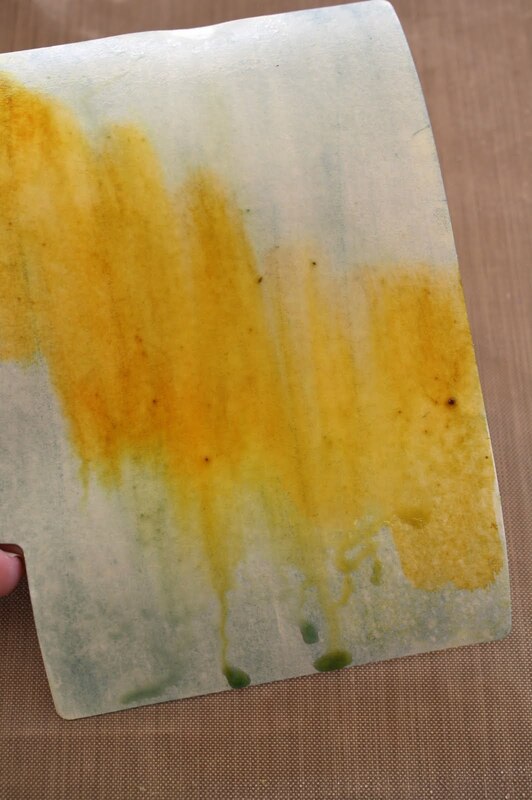 The third tabbed page was done with Spun Sugar and Peeled Paint. Once dry I added the 3 butterflies from this paper, some Tissue Tape-Sketchbook and some stitching. As I mentioned before in between the tabbed pages I cut about 12 sheets of paper and rounded the corners. I stamped each page with the Numero stamp to finish it out. Well, I hope you enjoyed this little watercolor adventure. I love the way you can mix two or even three colors and get such a cool effect with very little effort. I think this one will be appearing in a class project sometime soon. Very pretty. I love watercolors as well! Lovely, lovely, lovely! You are totally inspiring me to stop being productive and to go play with some paper and ink and paint and glue! very nice! i love your ideas! i can see where i need to get more stains. sigh. you're such an enabler. thanks. sigh. **big cheezy grin** and that stamp set!!! oh my word. nice! Thank you for showing us how you created the cover for this journal! 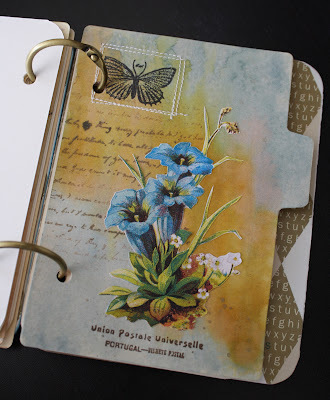 I love the way you've used stains, papers, stamps, collaged elements, and more in this one...has to be one of my favorites. this is lovely, and the Conservatory paper is one of my all time favorite papers! Love the idea of sealing the paper and then adding paint and wiping. very smart! Was going to stalk you and not leave comments but feel I've just got to say this is such beautiful work! We follow so many blogs, don't we that commenting on all of them would use up valuable crafting time but today it's just gotta be done! Beautiful! OK, you NEED to come to the Tampa Bay area and do this class!! I am seriously in love! Love this and I cannot wait for the Numero stamps to be available! I want to make something like that too. Oh, I really love this! And I really needed to know all of those steps and techniques. I have such a difficult time with layering (sounds dumb), but this is great information. I went out last night and bought the things I didn't already have to make the cover into a plaque! Thanks for sharing and for the great details! I'm back Paula! To tell you that the fantabulous Tim Holtz and Mario are currently at Whim-So-Doodle in St Pete FL teaching and I talked to Jill today to tell her that I wanted you to come teach classes. And she told me that she and her dd met you at Ranger U and she invited you to come. So I'm doing my best begging! Ppppppplease come teach at WSD!! I will be the first in line to get a seat! Gorgeous book! Love your techniques! Absolutely beautiful!! I've got to get some book board - I so want to try something like this! Thanks for sharing your gorgeous Journal Paula. Love the simple instructions and your pages are lovely. Inspirational work.